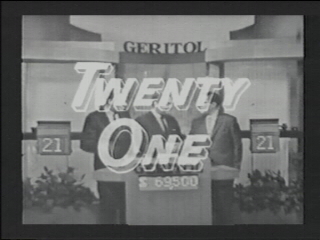 Twenty-One was the infamous quiz show of the 1950s that was the main target of deception during the Quiz Show Scandals. It, along with other shows of the time, were found to have been feeding answers to contestants to make their shows more interesting. Twenty-One pitted two contestants, each in soundproof booths, in answering questions with point values from 1 to 11 with the harder questions worth the higher point values. One booth is shut off so the contestant cannot hear what is going on. The other contestant is told the category, and he/she selects a point value for the question. If he/she answers correctly, he/she scores those points and the money to be won is $500 per point difference between the players. In case of tie games, the money value per point difference goes up $500. His/her booth is turned off and the other booth is turned on. The other contestant gets the same category and selects a point value as well. The basic objective is to score 21 points, but after two questions, the booths are opened up and the scores are not disclosed to the other contestant. Each player now has the option to end the game if he/she thinks he/she is ahead in the score can do so. The player ahead when this happens wins the game, is champion and wins the money in the pot. By 50s standards, the show was slow and dull and the questions mind-boggling hard. In 1956, a contestant named Herb Stempel was on a streak of luck on the show and faced a college professor named Charles Van Doren. The producers, Jack Barry and Dan Enright saw him as a clean-cut All-American type and wanted to groom him to be the next champion of the show. To facilitate this, Van Doren was given the answers to certain questions, and on the December 5, 1956 show, Herb Stempel was instructed to take a dive to make Van Doren the champ. On the category "Movies," Stempel's question was to identify the 1954 Best Picture Oscar winner, which was "Marty." He chose "On The Waterfront." That wasn't when Stempel's fate was sealed as play continued on into a tie game. The next game was worth $2500 a point difference, and after the second question for each, Van Doren was leading 18-10 and opted to end the game, thus becoming champion. Two years later, Stempel would issue charges that he was instructed to lose on purpose and Van Doren received answers in advance. Van Doren confessed to a Congressional hearing that this was true, leading to Twenty-One being canceled by NBC, replaced in a stop-gap move with a prime time edition of Concentration, and the network assuming production control on three other Barry-Enright properties--Tic Tac Dough (which would run to 1959), Dough Re Mi (which ran to 1961) and Concentration (which had a run to 1973). Tic Tac Dough was also confronted with cheating charges, leading to Barry and Enright being virtually exiled from television. Barry and Enright would emerge from their exile in 1972 to create new, untainted game shows and revive their Tic Tac Dough more successfully in 1978. The Twenty One scandal would be the subject of Robert Redford's 1994 docudrama Quiz Show. Some liberties were taken with the circumstances of Stempel's defeat--simplifying it rather than detailing it--but the film itself remains a fascinating look at the loss of television's innocence. Twenty-One would see the light of the cathode tube again in a new edition hosted by Maury Povich and produced by Rich Gurin and Fred Silverman. This 2000 edition ran from January 9 to May 28, and had different question structures and payouts. Shokus Video has the December 5, 1956 show on a compilation DVD. This page was last modified on 6 April 2017, at 14:00. This page has been accessed 2,880 times.